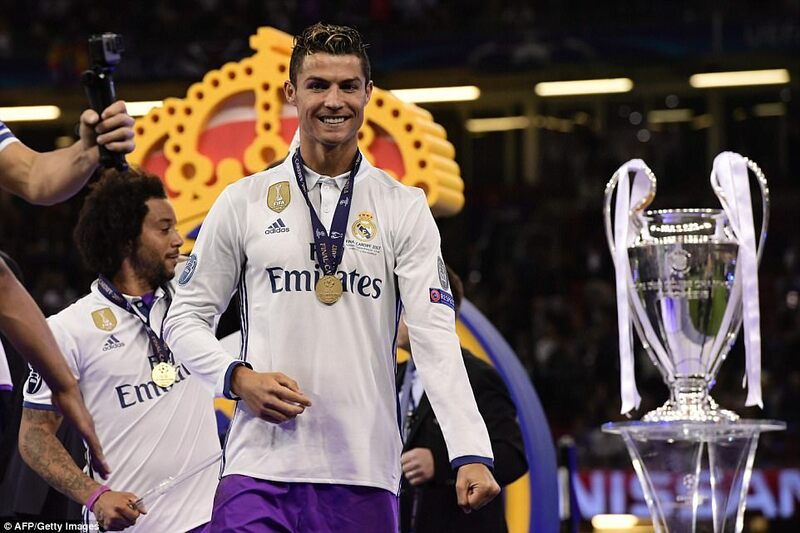 Cristiano Ronaldo wrote another chapter in his remarkable career as he starred in Real Madrid’s 4-1 win over Juventus to retain the Champions League in Cardiff. 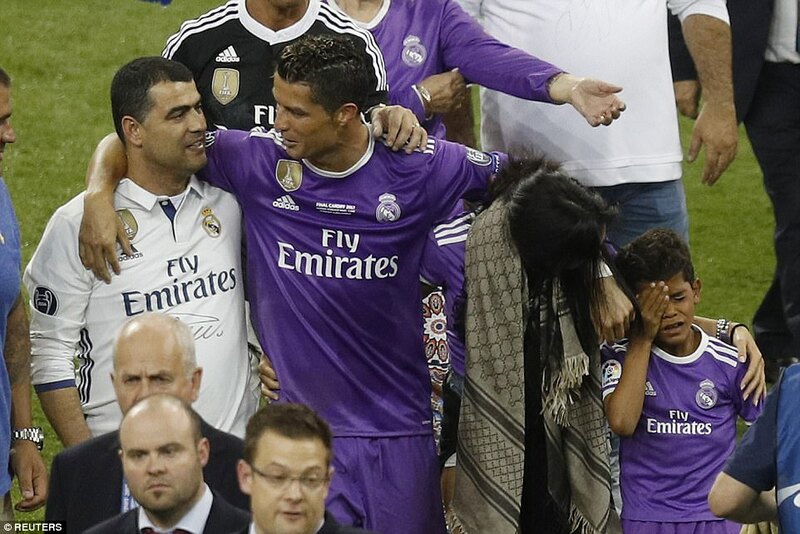 Ronaldo was joined on the pitch afterwards by his girlfriend Georgina Rodriguez, brother Hugo Aveiro and Cristiano Jr, who was clearly overcome with emotion after seeing his father spearhead another memorable night for Europe’s most successful club. 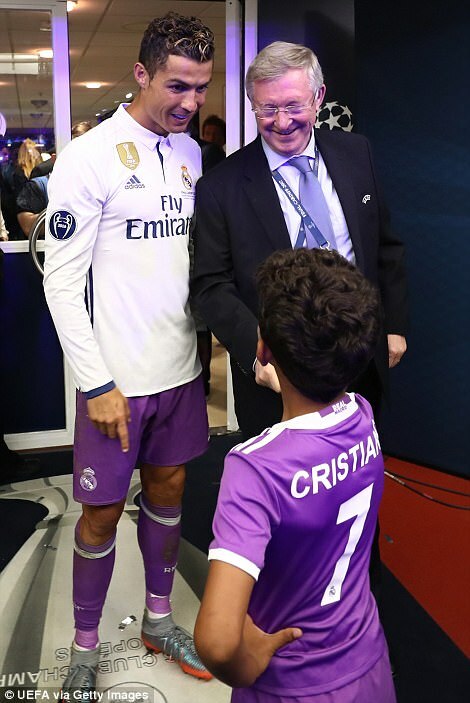 The 32-year-old was the star performer, scoring twice to take his tally to 104 Champions League goals – and he was congratulated by former Manchester United manager Sir Alex Ferguson in the tunnel after the fourth triumph of his career in the competition. 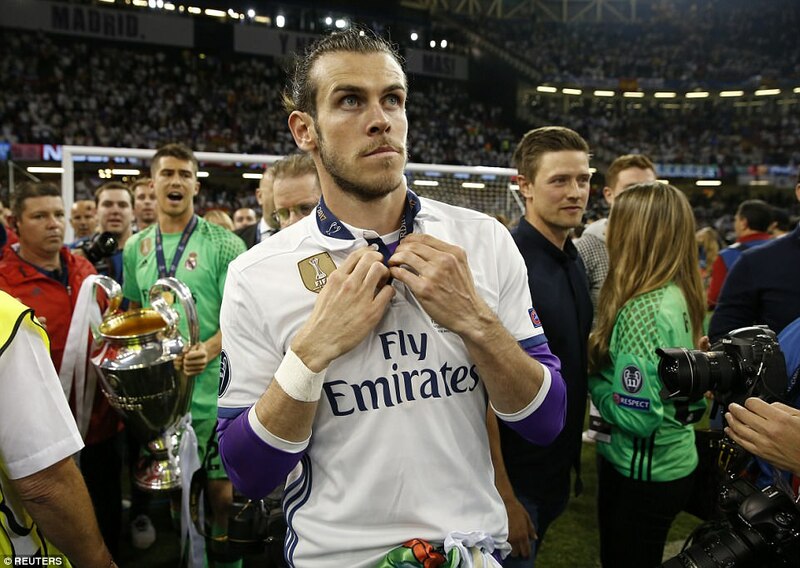 The celebrations will last long into the early hours of Sunday morning after Madrid overpowered the Serie A champions to be crowned Champions of Europe once more, with Gareth Bale playing his part. 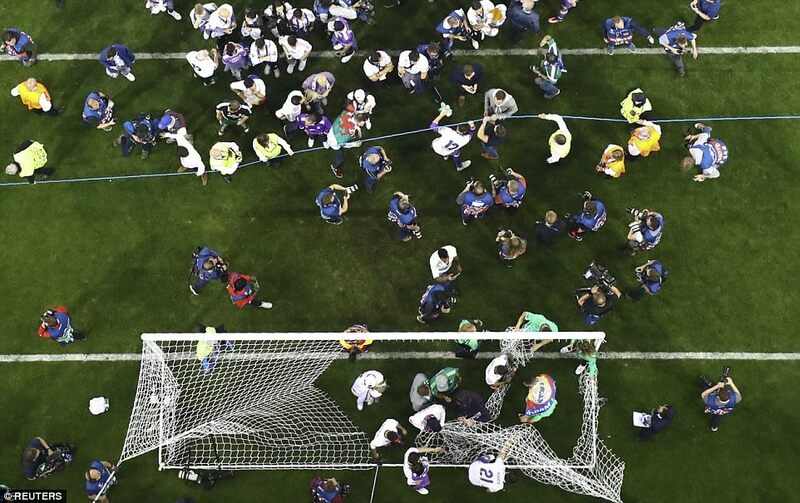 Barcelona congratulated their fiercest rivals via Twitter and they were not alone. 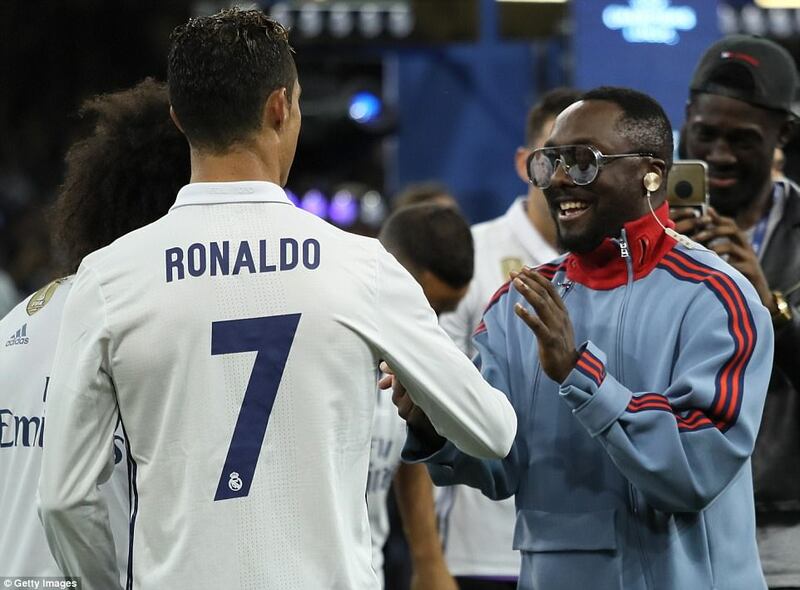 Even the American rapper will.i.am, back fronting the Black Eyed Peas, wanted to be part of the celebrations as he collared Ronaldo for a word prior to the trophy presentation. 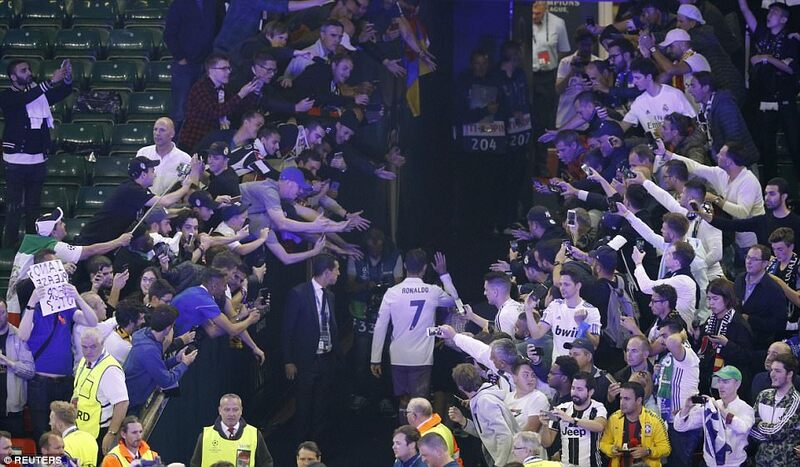 Ronaldo was voted man of the match as he reached 600 career goals with another brace against the Old Lady, either side of Mario Mandzukic’s sublime equaliser that had put the game in the balance at half-time. 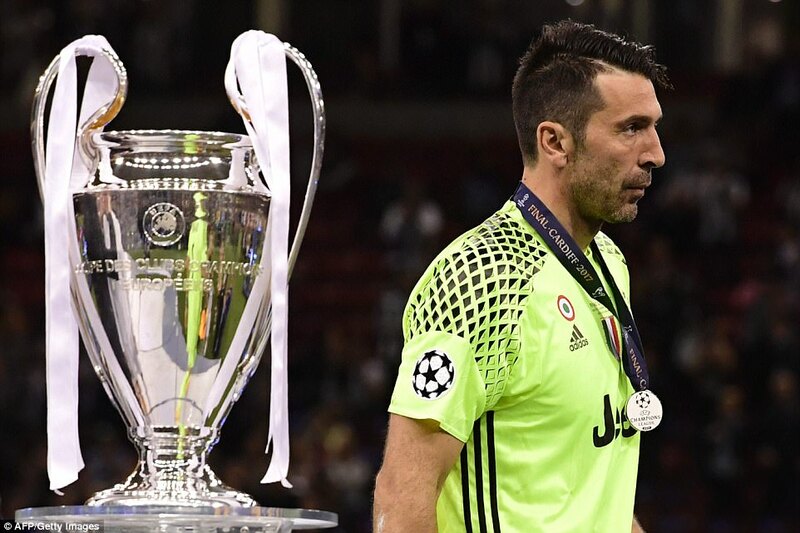 But having shaded the opening 45 minutes, Massimiliano Allegri’s side were outplayed thereafter and while Madrid become the first side to retain the trophy in 27 years, since AC Milan, it would appear Gianluigi Buffon will never get his hands on Europe’s most coveted prize. Real restored their lead through an unlikely source as Casemiro, who had only scored once for Real prior to this season, fired in via a deflection from range on the hour-mark. Within three minutes and six seconds, the final was effectively over as Ronaldo added his second, flicking in at the near post from Luka Modric’s low cross. Marco Asensio came on and added gloss to the scoreline with a fourth in stoppage time after good work down the left by the relentless Marcelo. 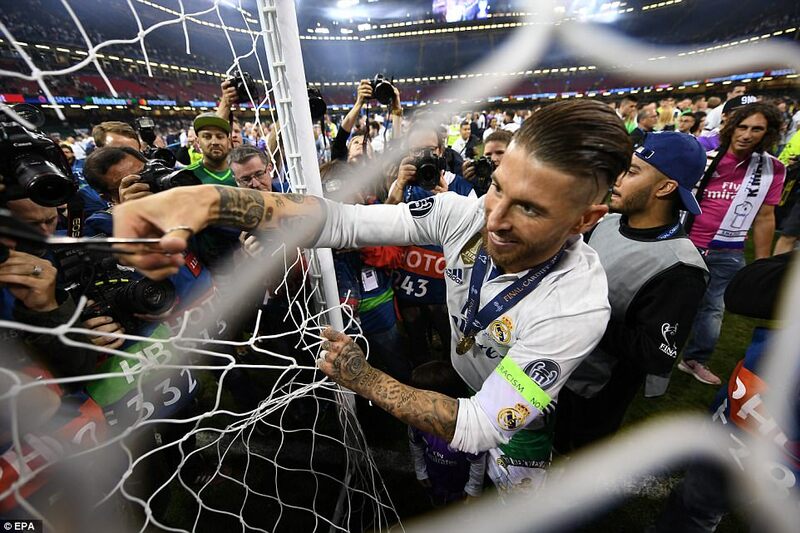 By then, Juventus were a broken outfit, reduced to 10 men after Juan Cuadrado had received two quickfire bookings for a petulant scuffle with Sergio Ramos, although the Spaniard didn’t cover himself in glory. 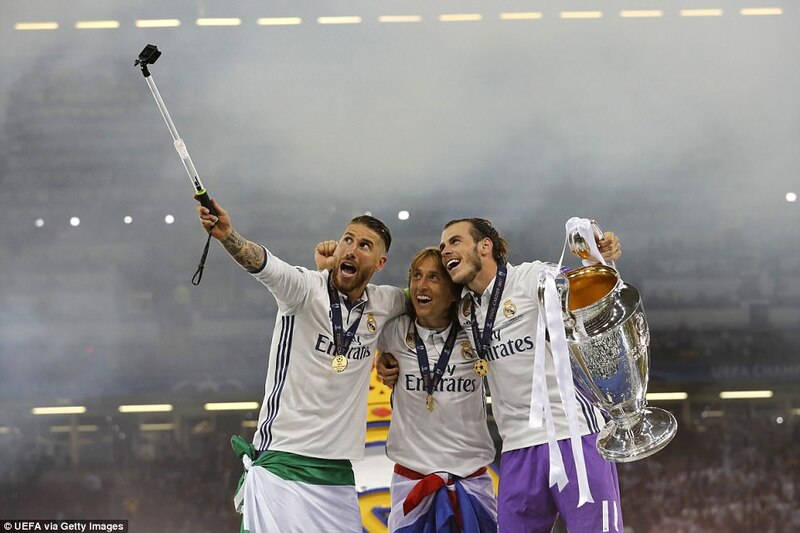 It all means Madrid complete a sublime double, having won La Liga for the first time since 2012, and the Spanish giants ensured they marked the occasion with joyous scenes raging from Cardiff to the Spanish capital on Saturday night. 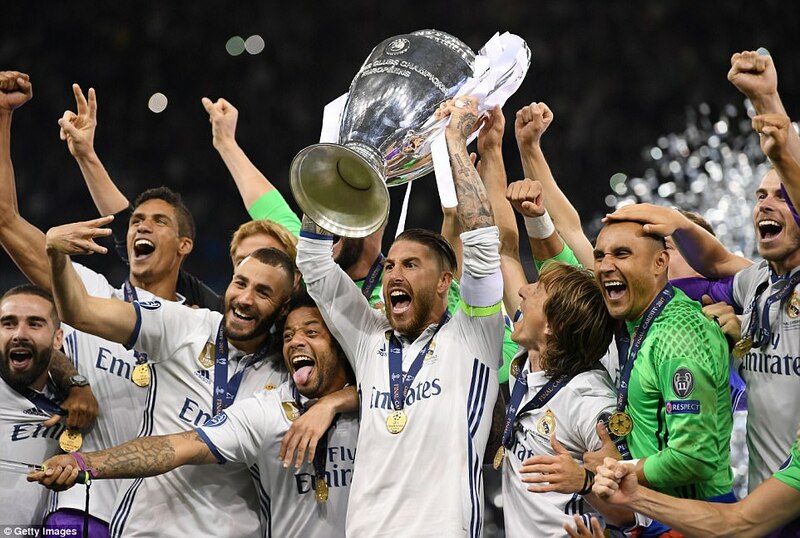 Zinedine Zidane’s side will bask in the glory of a 12th European Cup triumph all the way back to the Santiago Bernabeu on Sunday and the ensuing celebrations in Plaza de Cibeles that shall await them. 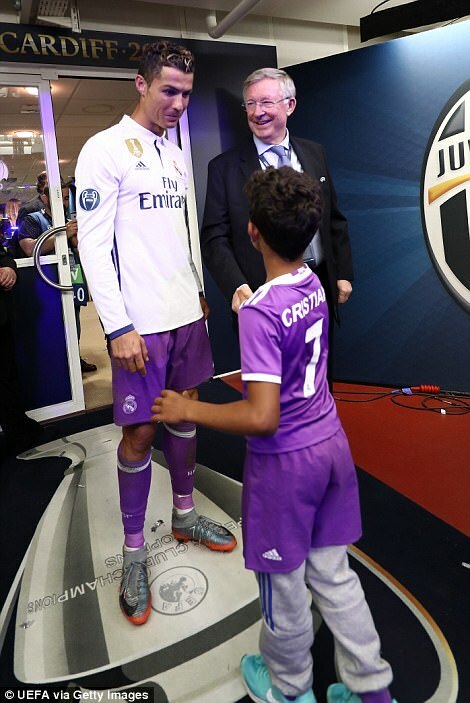 Zidane also posed for the cameras with his family, including his son Enzo, who also plays for Real. 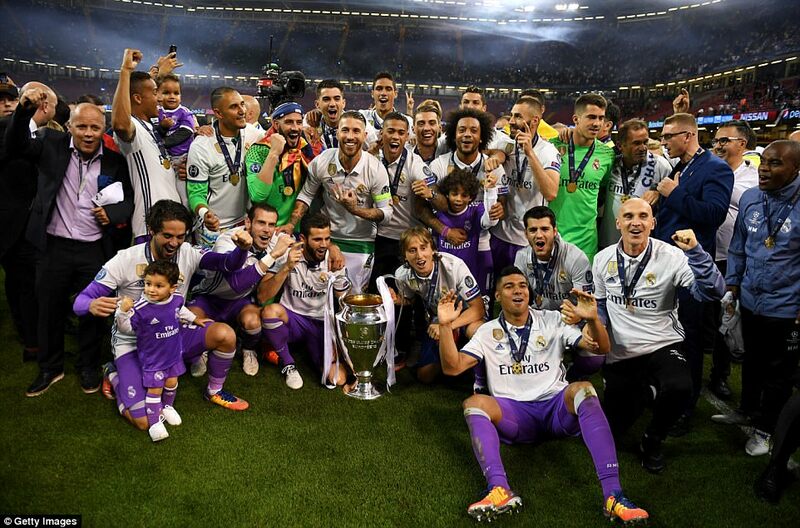 Madrid have won 12 of their 15 European Cup finals while the wait goes on for Juventus, who last won the competition in 1996, after the Old Lady were second best in all departments in the second half. 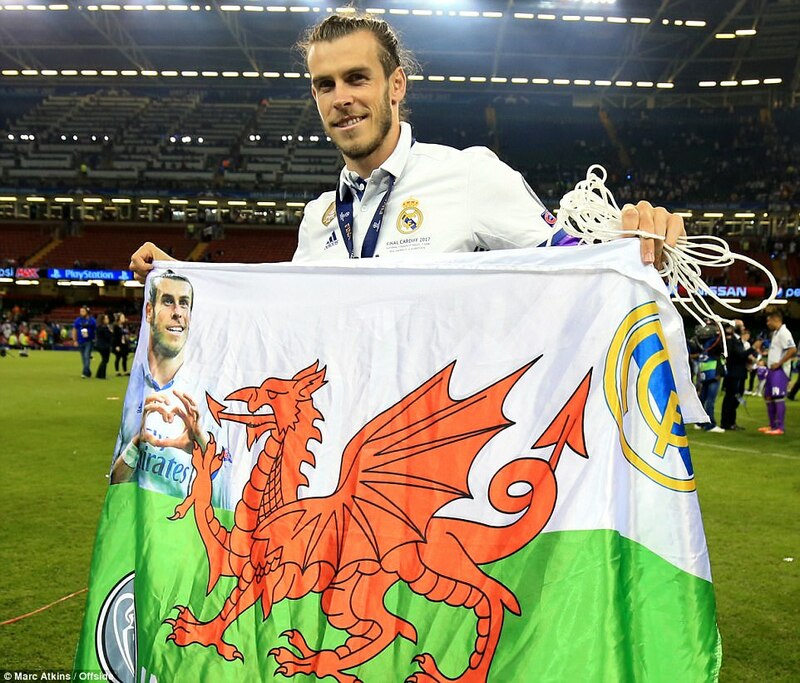 This was not quite how the returning Bale will have pictured the final when Cardiff was confirmed as the destination for the final, but having missed a huge part of the season through his calf struggles, the 27-year-old was delighted to have made an appearance. ‘The city have done an immaculate job in hosting such a brilliant event and we thank them for that,’ he told BT Sport. ‘Winning the Champions League here is a dream come true. This is reward for all the hard work. We’ve made more history. We’re very happy to win the 12th and we’ll enjoy this moment now. 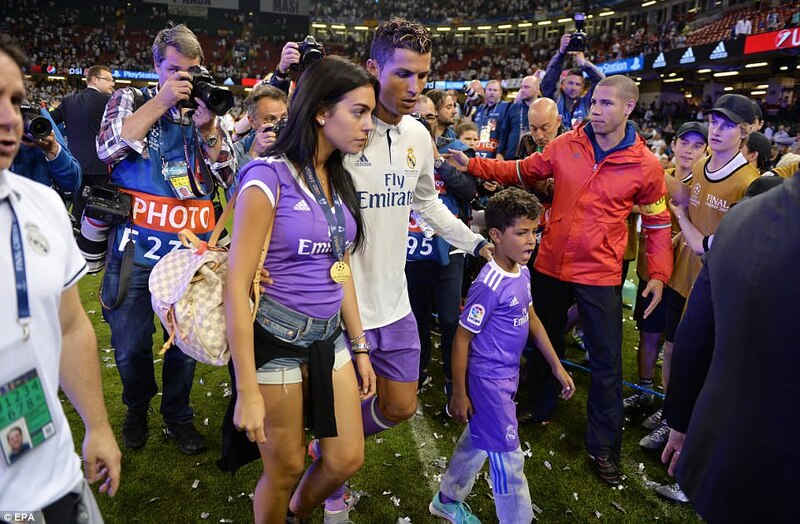 BT Sport pundit Steven Gerrard said of Ronaldo: ‘It’s frightening, and it’s scary. The Ballon d’Or should be his as these are the games that define players. The only shame for him as he didn’t get the hat-trick, as that would’ve been the quarter-final, semi-final and the final. When asked about Zidane’s incredible record since taking charge at Madrid, he added: ‘Everything he touches turns to gold. This is a guy that has been under a lot of pressure. They’ve got to reward him with a long contract, he deserves it. 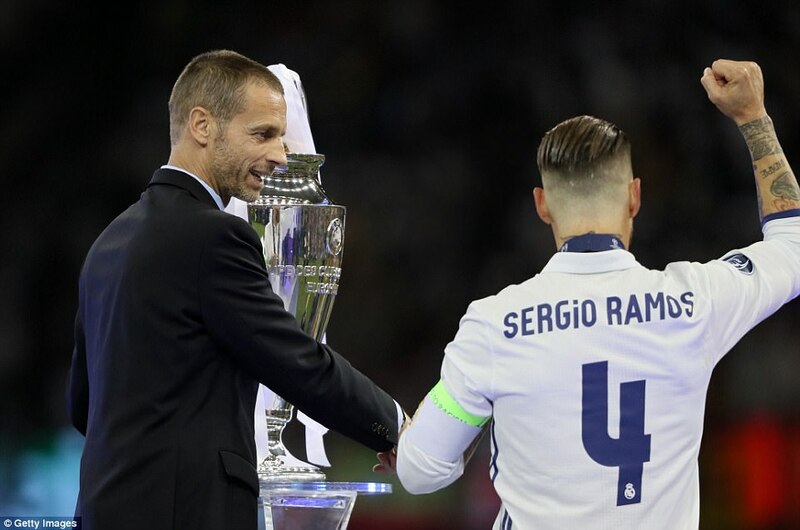 Fellow BT Sport analyst Rio Ferdinand was equally effusive of Madrid’s performance on the biggest stage, after the pre-match hype came to fruition in Cardiff. The former Manchester United defender said of Madrid’s performance: ‘The demand and the pressure on this club is huge. The achievement is unbelievable. They’re not as pleasing on the eye as the Barcelona team of a few years ago, but they’ve bought into Zidane’s tactics and they don’t panic. The game could’ve got away from them but they gathered themselves. 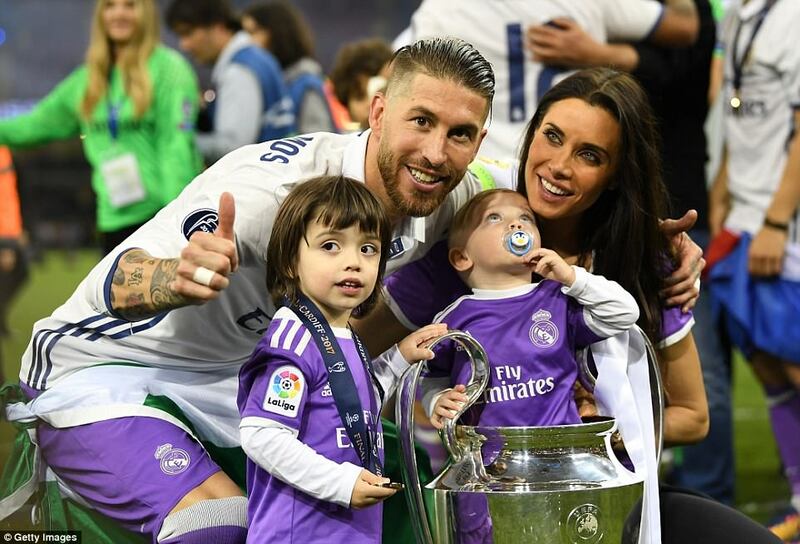 ‘Ramos’ experience is telling and he cruised through this game, as have many of them. Juventus were undone by the better team. Real Madrid took this game away from them.